Los Angeles could be in trouble for at least another week or so. It has been reported that Lakers’ point guard Steve Nash has a small fracture in what was previously thought to be simply a leg contusion in his left leg. The Lakers have had enough troubles to start the season, but with Nash being out for what appears to be at least a week, the Lakers woe’s look like they will continue. 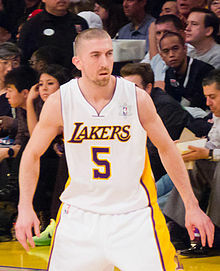 Of course, Steve Blake has been a perfectly adequate point guard in substitution of Nash so far this season, limiting his turnovers, hitting his three point shots (60% on the season), and keeping the Princeton Offense running smoothly around Kobe Bryant and Dwight Howard. He had his struggles vs. Chris Paul and the Clippers (mainly foul trouble), but he rarely has negative plays for the team, and knows how to play with the starters. The bench, however, has been the exact opposite, and without Blake leading the second unit, the Princeton Offense takes a hit with the second unit, as players like Antawn Jamison and Jordan Hill have looked absolutely lost in the pass and move nature of the offense. Other than turnovers and transitional defense, the biggest problem for Los Angeles has been the few quality minutes given by the bench, and as a result, the few minutes of rest the starters have had. Other than Steve Nash (who is only averaging 25 minutes a game), all of the starters are playing 35.7 minutes per game or more, with Pau Gasol topping the list at 39.7 minutes per game. It’s an insane amount of minutes for players who are old (Gasol and Metta World Peace are the youngest of the “old” starters at 32 years of age) or coming off of a major injury like Dwight Howard is. The bench has been the second worst unit this season averaging a measly 16 points per game on 41.9% shooting, the second worst offensive efficiency rating in the league at 19.3 and a negative defensive efficiency rating at -14.7. Despite acquiring Jodie Meeks and Jamison this off season, the bench has managed to be worse so far than the 2011-2012 Lakers bench. Los Angeles is likely in trouble with Nash out for so long because of depth issues. On paper, the bench looks like a very solid group that can spread the floor and give the starters some rest. In reality, that bench is thin, and doesn’t seem to understand the nature of the Princeton Offense. Antawn Jamison, as stated earlier, continues to struggle as he is only averaging 3.7 points per game, 4 rebounds per game and is only playing 16 minutes per game. Jodie Meeks has hardly played or made a difference in his time in. Blake is being pushed into the starter role. Jordan Hill has been disappointing to say the least and Devin Ebanks has been a non-factor to start the season. If Nash is indeed out for a week longer, that will be 3, potentially 4, games in which Nash will not be available, and the bench will have to step up, something I think they won’t be able to accomplish this early in the season, playing in an offensive system that they don’t quite understand yet. In the positive news for Los Angeles, the next four games will be vs. the 0-2 Detroit Pistons, 1-2 Utah Jazz (after two days of rest), 2-1 Golden State Warriors, who the Lakers (particularly Kobe Bryant) have had a history of playing well against, and the 0-3 Sacramento Kings. This is the stretch the Lakers can handle, on paper, without Nash in the rotation, and it will certainly test the 2nd unit on whether they can insert themselves within this scheme head coach Mike Brown and assistant coach Eddie Jordan have placed over the summer. A visit from Detroit could help Los Angeles get back on track. Though the Lakers had their five-game winning streak against the Pistons end with an 88-85 overtime road loss on March 6th of last season, they've won the last two at Staples Center by a combined 38 points. And in more positive news for L.A: Veteran guard Rodney Stuckey has totaled 10 points on 1-of-17 shooting and has missed all six of his 3-point attempts through two games.